Yet numerous retailers have found that millennials can be particularly discerning customers. It has been claimed they are less loyal than older shoppers. 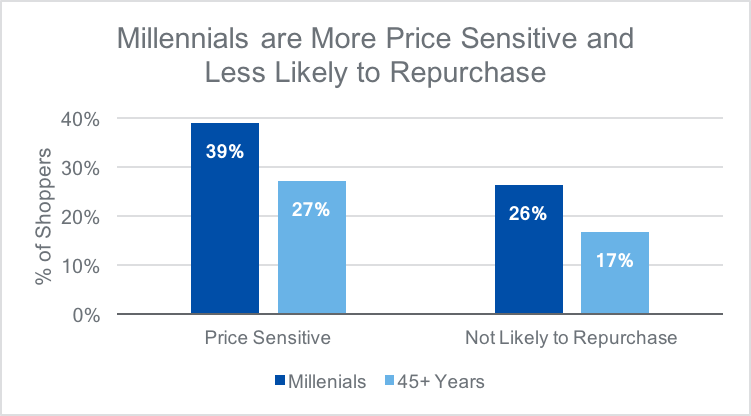 As a group, this is true: they are 40% more likely to be price sensitive, and 60% more likely not to repurchase than older shoppers. While some might use this as a reason to avoid engaging with this difficult generation, that simplistic excuse ignores a significant growth opportunity. When brands successfully cater to the preferences of millennials, or embody their values, millennials become highly loyal and are often willing to pay more for such alignment. 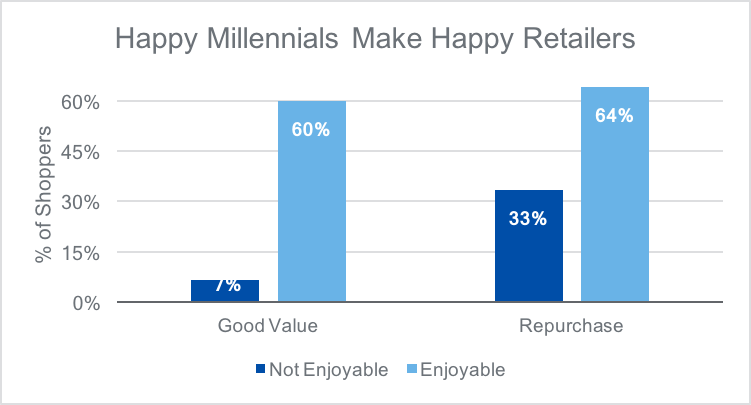 So how does a retailer make shopping enjoyable to begin earning these millennial dollars? In a previous blog, we shared three ideas to reduce millennial detractors, here I will focus on creating millennial promoters. I highlight a few concepts that retailers have implemented, and then emphasize the important infrastructure necessary to take advantage of the joy being created. Many retailers make shopping enjoyable using experiential retail. Fashion chain Urban Outfitters has opened coffeeshops and pizza cafes inside their stores. Nike is devoting less space to products, and more to Trial Zones -- including half-court basketball, soccer pitches, and a treadmill with virtual reality of Central Park. Vans Shoes latest stores contain skateparks, live music venues, theaters and art galleries. But you don’t have to use floor space to accomplish this: Ikea has held sleepovers, H&M stores have thrown concerts, and Lululemon has after-hours yoga classes inside the store. Another popular direction for retailers is to embrace social responsibility, in what has come to be known as “conscious capitalism”. 40% of millennials indicate they are more likely to buy when a product supports a cause they believe in. Some brands match purchases for those in need – Hanes’ socks and underwear; Tom’s shoes; Warby Parker’s glasses; and Leesa’s mattresses. Others donate a portion of sales to environment concerns. Patagonia donates 100% of Black Friday sales, and thousands of businesses have joined the 1% For the Planet organization. A few companies have found other imaginative ways to generate fun experiences. Whole Foods developed a recipe bot that allows customers to search using emojis for ingredients -- type in 🍆, 🍅 and 🌶️, get instructions for ratatouille. Residence Inn has introduced giggling, dancing, robotic butlers as a pilot project at a few Los Angeles area hotels. When given a positive rating for room service delivery, these 3-foot robots light and up shimmy. Spotify uses the listening habits of its customers to make highly personalized playlists weekly. Whichever route you choose, you will need robust data integration to measure how the joy produced relates to the bottom line. Keep track of which customers are taking advantage of experiential retail events; join that information with response history and purchase data; and quantifying the impact of the promotions becomes attainable. To determine the values of your customers, augment a survey with routine customer feedback and a study on key customer experience drivers. Assess the impact of a more inventive promotion by merging customer information with social listening and verbatim text mining on feedback to identify how customers are judging your performance. If you can gather and analyze the data generated, enjoyable shopping experiences will reap dividends from all your customers. Especially millennials.